No more maintenance. Less annoying garden chores. Choose all weather. Our range of all weather garden furniture is different. You don’t need to maintain it in any way, and you can leave it outside all year without a cover. This gives you back your time, and saves you money in the process! We have two types of weatherproof furniture for you to choose from, each with a distinct style. Traditional style, feels like real wood. Available in chairs, benches and sets. Available in chairs, sofas and sets. It looks and feels like wood, but requires no sanding, oiling, or covering. Perfect for those wanting the classic look, with a useful modern twist. The material is made from compressed polystyrene, which creates a dense material with a grain effect, giving it the look and feel of traditional wooden furniture. 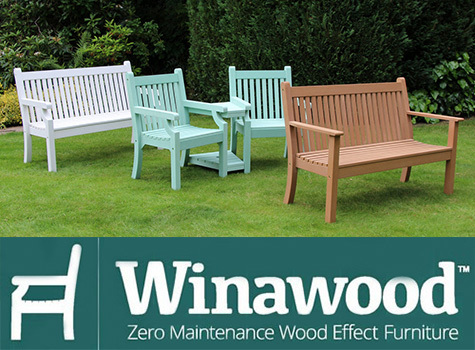 We’ve stocked Winawood for over 3 years now, and the feedback has been fantastic. It also comes with a 2 year manufacturers warranty on defects, which gives some weight behind the weatherproof claim. This is synthetic rattan, with hand woven strands, UV stabilised to prevent fading or damage due to the sun. This is built around an aluminium frame, that will not rust. These two things together make our rattan furniture weatherproof, surviving outdoors all year round without a cover. It will still look brand new in the years to come. 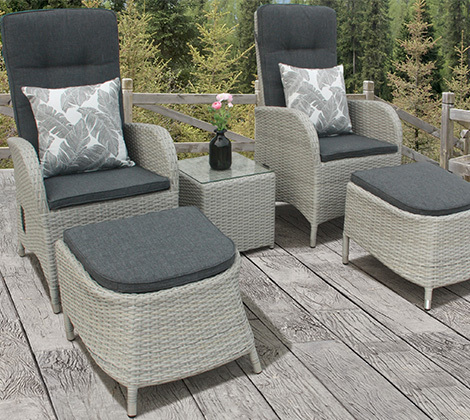 We have a range of dining sets, small patio sets, and sofa lounge style sets available both in store and online. We’re very well located for a visit, just off the M1 at Leicester. Why not come and see the range in store for yourself? You can contact us on 01455 274748 for more information, and you can browse the Google Map below to get directions from your home. The main benefits of all weather furniture are obvious, it simply saves you time and money. We recommend all of our customers make the transition over to weatherproof, it’s so much easier than managing a set of wooden furniture. We don’t even stock keruing anymore, as it simply isn’t as useful or as popular. You can find all of our all weather garden furniture online on Garden Centre Shopping UK (www.gardencentreshopping.co.uk). 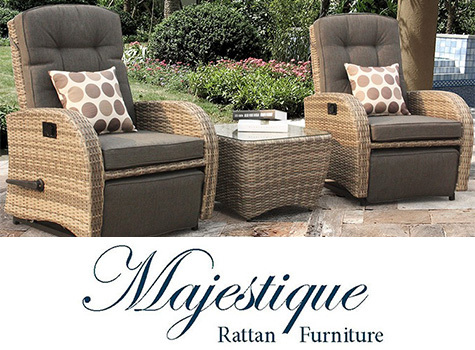 You can navigate back to our main garden furniture page, our reclining furniture page, or find out more about us here. You can contact Sapcote Garden Centre here, which includes opening times. We are one of the most popular garden centres in Leicester, especially now we have a brand new cafe!